Annie Dudek is a physical education teacher at William Southern Elementary in Independence, Missouri. On Thursday morning, she's hitting the road to Oklahoma City, to compete on NBC's American Ninja Warrior. However, this isn't Dudek's first appearance on the show. KANSAS CITY, Mo. — Annie Dudek is a physical education teacher at William Southern Elementary in Independence, Missouri. On Thursday morning, she's hitting the road to Oklahoma City, to compete on NBC's American Ninja Warrior. However, this isn't Dudek's first appearance on the show. "I've actually been doing it for five years," Dudek said. She decided to do it again because of one of her old students, Triton Weber. "I was at a point where I was just kind of like done with the whole experience, kind of moved on, thought I was just ready to do something different and Triton came to my class in October," Dudek said. "He's taught me to be strong, he's taught me to be limitless because he is limited in what he does. And everyday he comes in and he has a smile and he just warms the entire room and makes me want to be a better teacher." Triton, who has cerebral palsy, doesn't let certain limits, limit him in class. "I modify a little bit but for the most part, he wants to do everything and it made me think like, if I'm still physically able to do something like this then why not try one more year for him," Dudek said. That's why Dudek is bringing Triton and his family along to the show. "We're super excited," Triton's mom, Teresa Weber said. "Never thought we'd be doing this, you know? Annie's amazing. She's a godsend for him." Triton has a smile that's instantly contagious. Dudek hopes others can learn what she has from him. "He inspires me and that he inspires everybody to just kind of keep going," Dudek said. "His classmates love him and they always love to just be his partner and try and like include him in everything." It's the small daily interactions that have made a big impact on Dudek. "Whether I fail on the first obstacle or not, I'm just so glad to give this experience to him and his family because it's been such a great experience for all of us. So, I'm just glad to share this with all of them," Dudek said. "He's just kind of been this light this year for my school and for me." 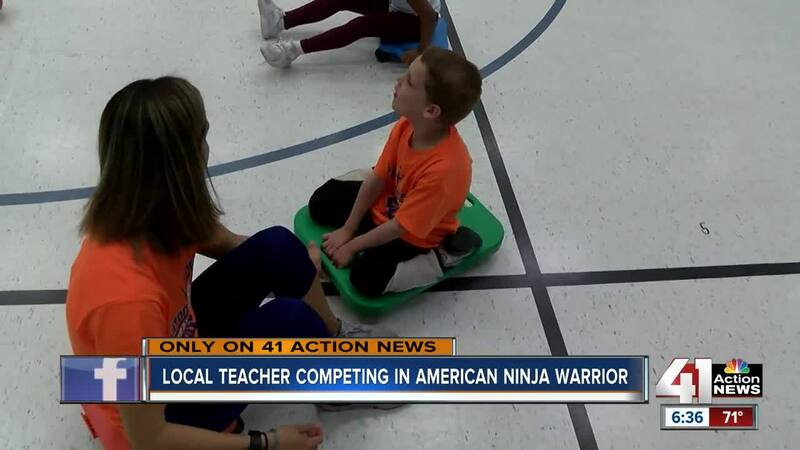 To follow Dudek and Triton's journey to American Ninja Warrior, check out Team Dudek, and the hashtag, #TritonStrong.